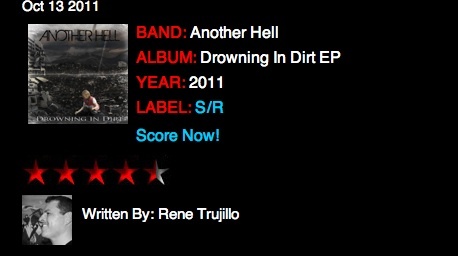 ThrashHead Magazine reviewed ANOTHER HELL’s Drowning in Dirt EP and loved it. So much they ranked it 4.5/5. There is nothing better than getting turned onto some seriously friggen kick arse music by happenstance…no labels, no word of mouth, just by pure chance. This is exactly one of those instances. Another Hell, formerly known as Aqua-head, is a Swedish band who describes themselves as being “rust metal” which they define as “a progressive mix of sludge and groove metal”. Though I can hear a bit of sludge in there through Kristoffer Englund’s growls, I also hear a lot of thrash and HC flowing from Henrick Samuelsson’s D/blast beats combination as well as the ripping axe work, from both Englund and Olof Gardeström and Jim Edström’s heavy bass. These guys are authentic, a band whose music does all the speaking for them. The growling vocals, which is so prevalent in various metal genres nowadays, often really turns me off an album, because the vocal style is so overused and I think a lot of musicians never realize how much talent it really takes to pull it off. This is not the case here! CLICK HERE to read the full review. It goes much deeper… right into the band’s philosophy. You’ll enjoy it!